Client Xchange is a secure portal that enables our clients and our company to easily and safely exchange tax documents. 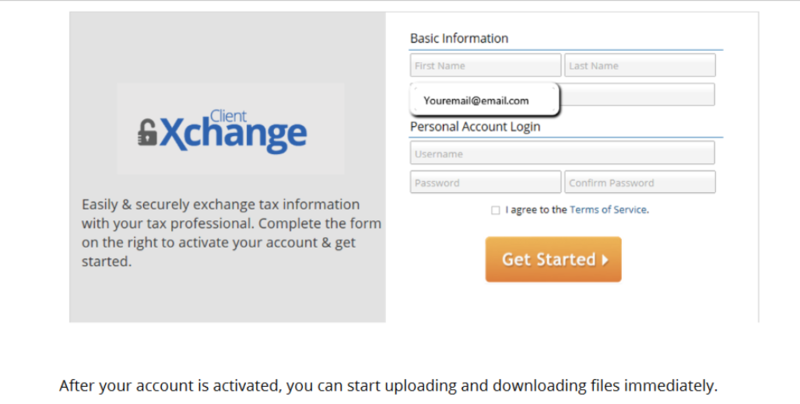 Client Xchange allows our clients and our company to upload and download sensitive information without worry. Data is encrypted and stored on our secure servers. Our clients will enjoy the convenience of delivering encrypted W-2s, 1099s, statements, spreadsheets and photos of receipts to our company from the comfort of home on a PC, tablet, or smartphone. You will appreciate saving drive time and gas. You will receive an email invitation from our company that contains a link unique to you for security purposes. You must click on the link in your email in order to activate your account. Simply enter your name, a username and a password (see the screenshot Above as an example) to get started. You can create your security questions and answers also.